Tom Alden - Welcome to TLA fitness news page! by	Tom Alden in Latest news from TLA Fitness! Next Race: ITU Long Distance World Champs, Spain. 2019 Main Objective: To perform well at Ironman World Champs, Hawaii. In 2014 I first had the idea (‘dream’) of trying to qualify for the Ironman World Champs in Kona, Hawaii. At this point I was totally deluded to what that really meant but I knew it would get me out of bed every morning and give me a challenge that excited me like nothing before. At this point my swimming experience or ability was close to zero, my bike was fairly strong as I cycled with clubs and dabbled in some road racing and even though I didn’t run at this point I was sure that I could pick that up fairly quickly. How hard could it be…? Five years down the line, I can safely answer that question with ‘bloody hard’! The level of performance needed to qualify for Kona now is outstanding. In my current Age Group (30-34), the top 4 finishers of an Ironman are given the privilege to race in Kona. So out of around 2,500 participants at these events, my Age Group will have approximately 250 athletes and only the top 4 walk away with the mystical Kona slot. I was lucky enough to get this 4th slot at Ironman Wales 2018, which means I will be heading to Hawaii in October 2019 to toe the line with the very best athletes Ironman has to offer. Having fine-tuned my training, thanks to coach Rachel Stoakes a typical week will be 6 days of training twice a day with one day of full rest or active recovery. Swim: 16km/4h. Mostly in a 25m pool but once the sun is out, one session a week will be in a lake. Bike: 200km/9 hours. Usually broken down into 4 hours on the indoor turbo trainer and 4 or so hours on the road. Run: 45km/3.5h. A mix of off-road trails, road and track sessions. Also ‘brick’ sessions (run straight after a bike session) start to feature as race day approaches. Gym: 2h. Focusing on areas of weakness, injury prevention/rehab and specific strength work. Sports Massage: 1h. Best hour of the week, by far! The above may seem manageable (which of course it is) but what gets tough is the fact that consistency is really key. The above is what happens week after week, month after month and year after year. Balancing that with full-time work is an added challenge which most Age Groupers face. I’m often asked what the secrets are to getting through the tough sessions. It’s really hard to answer as there are no secrets but here are a few tips that could help you. For example, I have been set a few three-hour indoor turbo trainer sessions. So, it’s just me at home on a stationary bike staring at a wall thinking ‘how has my life come to this?’. But wait, it can be fun, honest! Understand why you are doing that specific session. 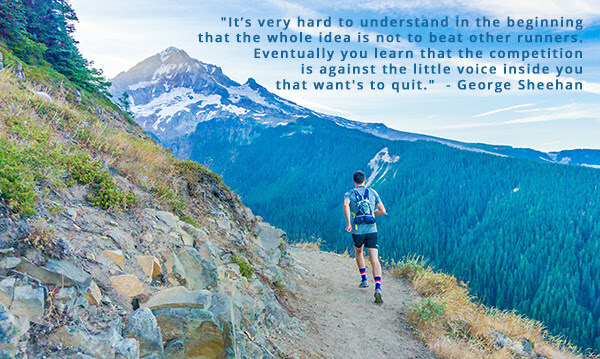 Then you will never ask yourself ‘why’ or ‘what’s the point’ when your legs and lungs are screaming for you to stop. If you are not sure, then ask your coach, do some research or ask someone who knows. This is so important! Embrace the solitude and the pain. You will have at least 9 or so hours of this come Ironman race day. If you are always entertained or distracted you will have a real shock come the race. Don’t be scared of spending time with your own thoughts and get to understand what your mind needs to get through the tough times. Have objectives during the session. In my case all the sessions are based around power numbers (watts). Personally, I just stare at my little computer between my arms for hours on end trying my absolute best to hit the prescribed numbers set by coach Rachel. There are lots of training apps and programs (Zwift, Trainer Road etc) available now which can also help in setting and hitting objectives. Be well fuelled. During a 3h session I can easily get through 3 litres of water with electrolytes (Precision Hydration), 2x energy gels and if it gets bad an energy bar or two. Remember fuelling has to be right before and after the session too. Surround yourself with the right people. If those around you understand how important this challenge is to you, they will support you and even motivate you at times when the training seems to be never ending. Find others who are doing similar sessions and team up with them. Share the pain! In a nutshell, if you really believe the challenge you are doing is worthwhile and exciting, then why not commit 100% towards doing the best you can!? That shouldn’t only be on race day but in the months leading up to it too. Don’t be scared of the daunting task, be excited and remember how lucky we are to be healthy and physically able to challenge ourselves in this way. Feel free to contact TLA if you have any questions or want help in achieving your goal. Special thanks to: TLA for their amazing support! Those chilly mornings are nearly upon us and not to mention so is the rain already! However, none of this stops you dedicated TLA’ers from striding out into the wild to roll around in the mud and enjoy what nature has to offer! It's fantastic to see you all so motivated to keep training outdoors throughout the Winter - this is often a time when some manage to find an endless list of excuses not to train – so keep it up! TLA's new Ultra-Fit classes are proving to be very popular and we are so pleased to see some new faces coming along too. Both Monday and Wednesday classes have started off well and are now part of a great training routine for all of you who attend. Variety is at the top of the list to keep you all engaged and motivated and we are extremely excited to continue this forward into 2019. Saturday 22nd December will see the last TLA Cumnor Bootcamp. We know some of you dedicated Saturday bootcampers will be sorry to see this class go HOWEVER, TLA has been spicing things up a bit recently by introducing new classes, one of those being a new Saturday class ‘Battle Strength’ which takes place at the TLA Studio. Battle Strength is a structured class whereby you will need to commit to weekly blocks of training. Battle Strength is progressive and working you on a whole new variety of training methods. We truly understand that mental strength is just as important as physical strength to unlock peoples potential and chances of success. The only way to find out about Battle Strength is to come and give it a go. You will require the willingness to commit physically and mentally and to not be carrying any injuries. 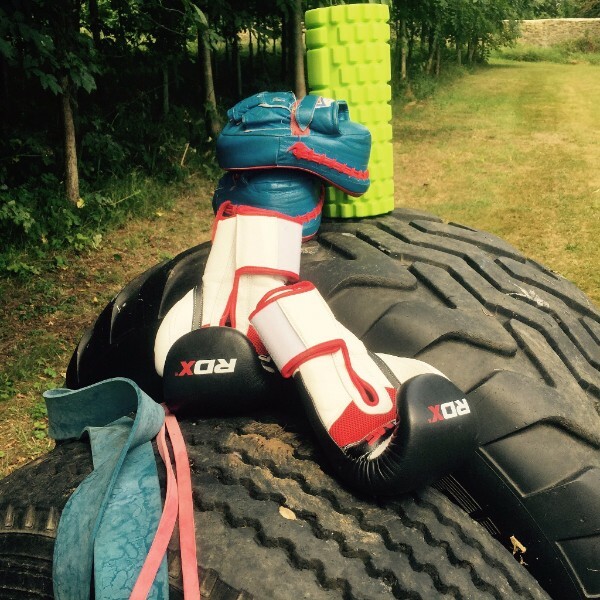 Battle Strength will always be held outdoors at our TLA Fitness facility in Sunningwell with each and every session being different to the next. So.......why wait?! There are only 4 x 30 minute spaces available so BE QUICK! Your next TLA Fitness newsletter will contain all the details and introduce the 2019 TLA Pyrenees trip, whooooo! TLA Fitness will be continuing with all TLA membership classes up until and including Sunday 23rd December. TLA classes will re-start on Wednesday 2nd January 2019. A very good morning everyone. I am delighted to bring you this October newsletter. On top of the New Ultra-Fit 1 class we are introducing Ultra-Fit 2 (see below). The TLA Fitness team is excited to announce our fantastic member of the month and also a golden ticket opportunity for a FREE sports massage.........on top of all this there is more... however a second newsletter will be on it's way to you next week. TLA is renaming the TRX & Spin fusion class to now Ultra-Fit 2. The class will continue to start at 18:15 for 45minutes. Classes will not exceed one hour and programmes will always vary in length and focus on different types of exercises. These classes will be suitable for all abilities - come with an open mind and a willingness to have fun and really engage in Ultra-Fit! TLA's Member of The Month! This month we would like to highlight someone who embodies the TLA spirit to it's fullest. That is trying new things, and throwing your self into what you do 100%. 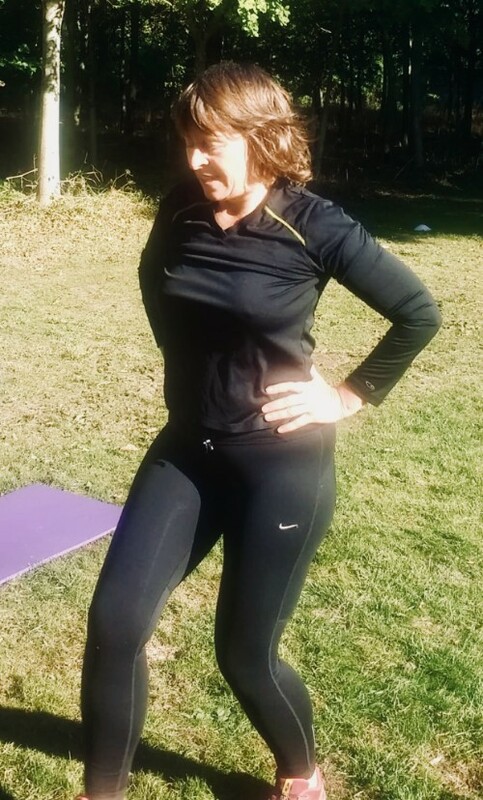 Amanda Benstead is a regular at Heather's morning Bootcamps and has attended TLA classes for some time. She is a great addition to the classes being committed, enthusastic, hard working and great fun. Recently Amanda was giving an amazing opportunity - a chance meeting on a long haul flight resulted in her being given a ticket to the Burning Man festival (Google it!) - basically, it is a festival of art, music , performance, and everything else you can think of out in the Nevada desert, you bring everything you need, you leave no trace when you leave. Instead of saying, thanks but no thanks, Amanda took the opportunity and travelled by herself to take part and had an incredible time. This may not be a fitness related achievement, but as mentioned at the beginning, it is what embodies the TLA spirit - take the opportunities, try the things that frighten you, don't be afraid to experience new things. So whether that is entering your first ParkRun, running up Snowdon, racing in the freezing conditions of the Yukon or travelling solo to a crazy festival in the deserts of the USA, in the words of a fitness brand you may have heard of 'just do it'!! FREE Sports Massage...? Read on and be quick...! 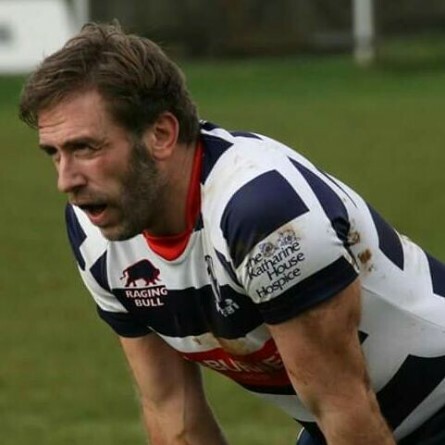 Simon Brand, Whilst playing full-contact, first team rugby at 40 years of age, Simon realised that if sports massage could keep him fit and on the field, it could help anyone! 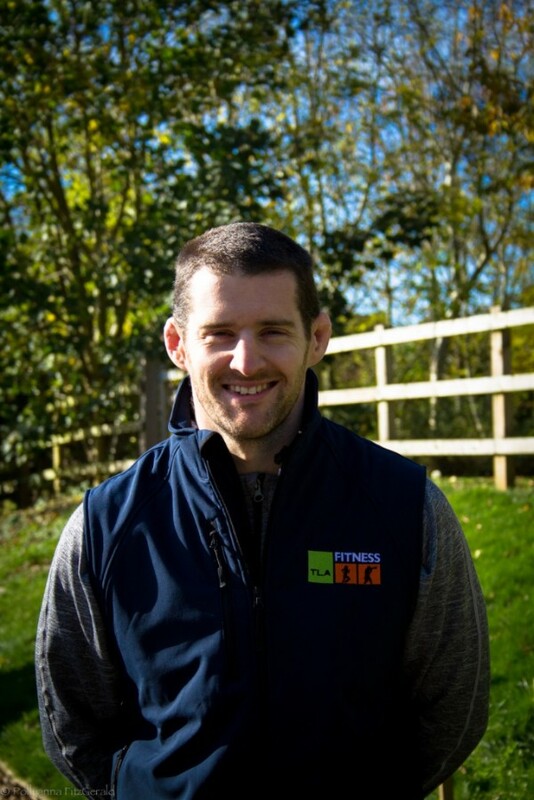 Currently studying for a BTEC Level 5 in Soft Tissue Therapy with Oxford School of Sports Massage, he assists at Abingdon and Banbury Rugby clubs as well as providing post-event massage work, such as at the Blenheim half-marathon. Ultra-Fit involves lots of different types of exercises, starting with cardio-vascular and moving on to muscular endurance. It is good for metabolic conditioning and taking the body through a transition of these disciplines. We are super excited to launch this class. Classes will be led by Jim Thorne and Tom Alden, both former Royal Marines that have previously competed in Ultra-Fit. Classes will not exceed one hour and programmes will always vary in length and focus on different types of exercises. These classes will be suitable for all abilities - come with an open mind and a willingness to have fun and really engage in Ultra-Fit! Is all last years kit still OK, or does it need one or two additions? If you are new to running and want to keep running through the Autumn and Winter months, as it gets cooler in the mornings and evenings, you will need to put on an extra layer/base layer. On colder mornings those first few minutes when you get out of the door, are when you will feel the chill. Lightweight hat and gloves will help you cope with this. 3. Are you visible out on the run? With the shortening days, just make sure you are safe, particularly out running. There are many hi-vis tops and jackets in our clothing ranges and reflective accessories and head torches to help you see and be seen. No need to think that Autumn is a time to ease back on your running, whatever your standard and whatever your goals. Many runners find autumn the most exhilarating time of the year to run, whether you are just trying to keep up a gentle 3-4 day a week class/run routine, or starting to lay the foundations for a spring event. Enjoy yourselves this autumn. 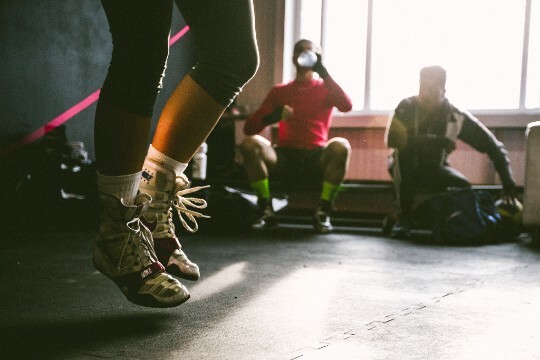 Are you getting the most out of your training session? 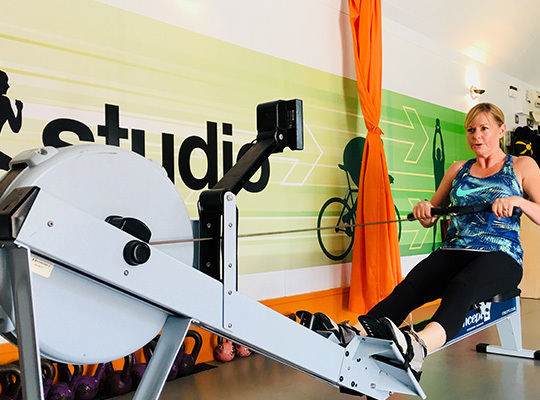 Be it a bootcamp, studio class or PT, no session at TLA Fitness is ever easy. You put yourself through the pain and then what? To get the most out of training sessions it is essential to eat afterwards, and as soon as possible after. 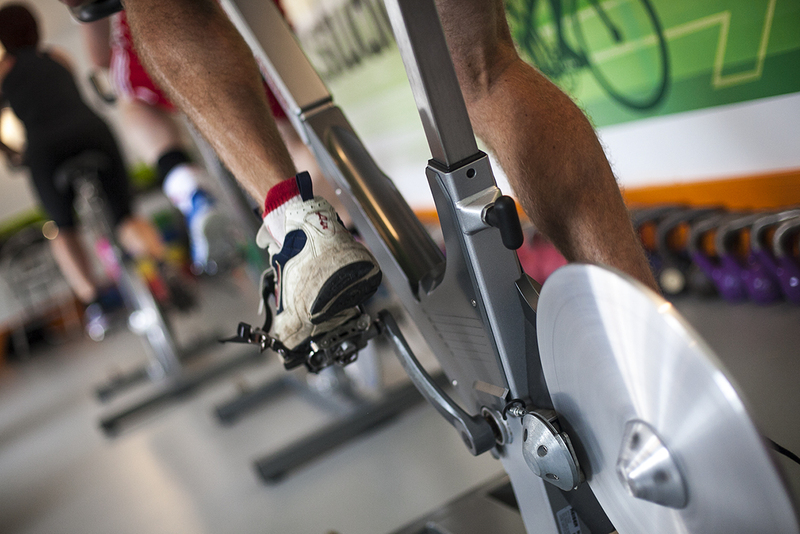 When exercising, muscles rip and to reduce the risk of injury they need to be repaired. Additionally, most of us want to build muscle and get stronger. Both muscle repair and strengthening is dependant on protein. If exercising for general fitness, then eating 20g of protein after training is enough. For greater muscle hypertrophy and those more interested in bodybuilding or athletes in a strengthening phase of training, the recommendation increases to 50g. But for the masses 20g is ample. So what is 20g of protein? Eating is the easy bit! And here is a delicious recovery snack that makes the most of the abundance of free blackberries available at the moment. Tony has been an exceptionally strong member of the TLA Fitness team since July 2013. Tony was a bit of a silent assassin; cool, laid back, but should your form go off, he was on top of it and it was only at the end of the class you realised how hard you had worked with his 'just one more rep in the next round' or his favourite surprise finisher of a 5 minute burpee test. But what Tony will be remembered for is his 'little bursts of speed'! Limited tickets and we will work on a first come first served basis. It promised to be a great day for some swimming, cycling and running: the glorious sunny weather really brought out the colours in our TLA sponsored Cumnor Kites kit! As Gemma Pitts, John Rogers and I entered transition before our midday wave time, we had to pause to allow some athletes in their T2 head out on the run: looking strong as he sprinted past, David Wigg was able to ‘high five’ us as we wished him luck for his last section of the race. Wet-suited up, we headed down to the lake and shared a few tactical navigation tips: reading the wind patterns on the water we decided to start on the right and leave the others to do battle on the left. As it happens most people were ahead of me so it didn’t really matter! Before we knew it we were out of the lake and starting the long 500m climb back up to the courtyard for T1. The downhill start to the 3 lap bike course is always exciting. The course was busy but dry allowing us to really build up some speed. Unfortunately, Bladon Bridge wasn’t ready for John; he chose to lovingly protect his bike whilst simultaneously acquiring a little bit of road rash on his first lap. We’d been on the course for about an hour as we left our bikes in T2. The temperatures were picking up and the 5.6km hilly, 2 lap run certainly used the last of my available energy. Gemma finished looking strong and took 4 minutes off her previous time. As for me, I was a few minutes down on my PB, which will inevitably lead to me signing up for yet another ‘last Blenheim Triathlon’! Following on from Adrian, Gemma and John's exploits at the Blenheim Triathlon - it is good to talk about the benefits of Sports Massage both pre and post event. You don't need to have a specific injury to make use of a massage - it is a great tool for keeping your body in good condition to stand up to the rigours of training. Please contact Pollyanna on pollyanna@tlafitness.com to book in for a massage to reap these benefits. Whether you have run a 5k or Man V Horse, massage can benefit everyone. We have a new feature for the TLA newsletter - each month we are going to be shining a spotlight on a TLA member who, for us, stands out. This is a difficult task as all of our members are fantastic and give everything to each training session. However, this month, we are giving special praise to someone who has just gone from strength to strength and that is Nadine Hunter. Nadine joined TLA in 2009 and quickly became a regular at bootcamp sessions and a very loyal and committed TLA member. Nadine has been a role model over the recent months, she trains so hard and now gives many members a real run for their money! She takes part in numerous events including the incredibly tough Man V Horse event and the TLA Pyrenees trip. Nadine is extremely dedicated to her training, even running when everywhere was flooded, however a slight deviation from the flooded river path resulted in a dunking in the river! Not to be detered, Nadine finished her run, albeit rather soggy!! (this was in the Winter too!!!). So please join us in congratulating Nadine as our first member of the month! We are thinking ahead to the summer holidays which are not all that far away now!! We are going to run our Family Bootcamp again this year for 6 weeks starting on Wednesday 25th July and running until Wednesday 29th August. The classes will be held at the TLA Studio in Sunningwell and will start at 9.30am. Price will be £10 pay as you go for adults and £5 for participating children, or you can pay for a block of 6 for £51 (£8.50 per class). Members on block booking can also use their cards for this session. As always, children are very welcome to come and join in, or they can watch and play in the woods behind the Studio. We look forward to seeing you, keeping you fit over the Summer and having some fun while we are at it!. Please contact Heather on heather@tlafitness.com to book on. Thank you for re-subscribing to TLA Fitness after all the GDPR nonsense. It's good to have you on board! You will continue to receive a monthly newsletter which will include important updates on classes, information on new classes, upcoming events and next month we will be introducing 'Member of the Month' plus the TLA Instructors will be bringing you training tips and techniques. 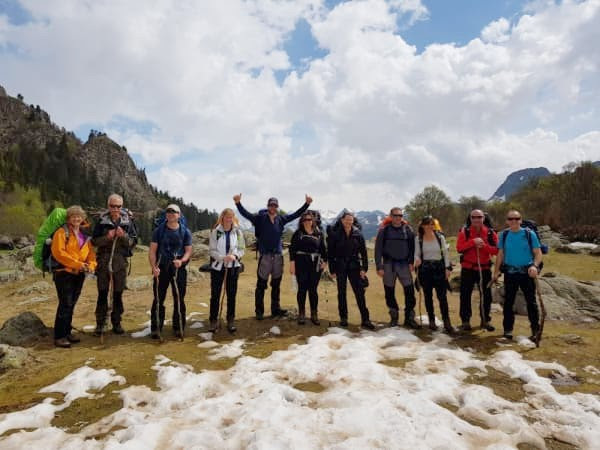 "Hiking and camping in the French Pyrenees in May - what a great idea - or so 11 TLA members, under the guidance of Tom, thought - with just a little trepidation. Any concerns we may have had, however, quickly disappeared as we learnt how to put up a tent in under 7 minutes and set off on our 2 day trekking expedition against the stunning backdrop of the Pyrenees. As we worked our way up the mountains we basked in the sunshine, got wet in the rain, battled against hailstones and finally encountered snow, forcing us to pitch our tents sooner than expected. With a cold night looming, our very own action man Clive got a fire going after a relentless 3 hours but conditions were really extreme for the time of year. Approaching midnight we were faced with the prospect of a night of uncertainty in one man tents or we could leave the rehydrated spag bol behind, trek back to the chateau where a log fire, a beverage or two and our mobile entertainment awaited and as discretion is the better part of valour, we headed back. So - a little trepidation was wise but none of us could have foreseen the degree of adventure, challenge and laughter we all experienced. A thoroughly inspirational and exhilarating few days with big thanks to Tom at TLA and Kev our host at Action Adventures!" 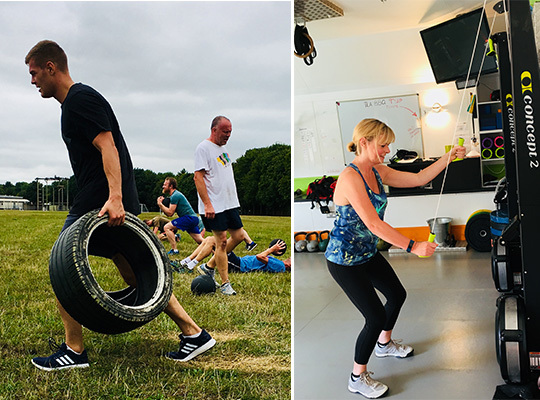 Please do come and join TLA for the Cumnor Bootcamp 8am on 7th July followed by Breakfast in The Bear & Ragged Staff at 9am, you will need to pre-order (see menu) kindly email: heather@tlafitness.com to BOOK and PRE-ORDER, Thank you! 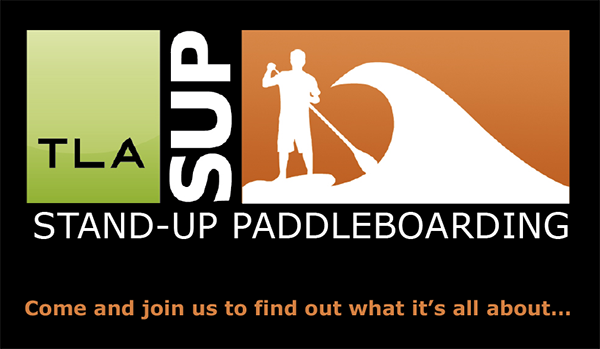 Come Stand-Up Paddleboarding with TLA SUP this summer! 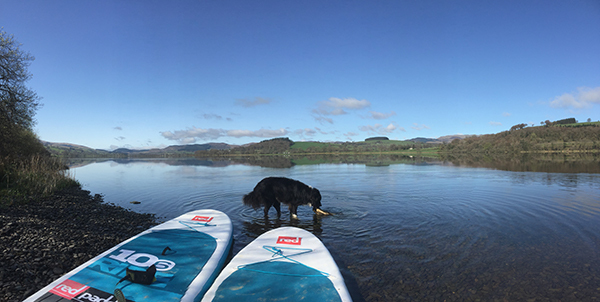 The UK fastest growing water sport is on your doorstep and we cannot wait to take you out on the water. You have most probably heard about the new GDPR rules and so we are now starting afresh with a new mailing list. If you'd like to continue to hear from TLA SUP and TLA Fitness please click the link below to sign up. As always, you can unsubscribe at any time. Good Luck, enjoy the weather and we look forwards to seeing you very soon, hopefully on the water! Now that the beloved month of January is gone for another year, let's now look ahead towards the upcoming season of events! Yep...it's just around the corner and before you know it you'll be on the start line heading towards that personal best or taking part in that lifetime goal. Whatever it is you are aiming for, make sure you are prepared! 'It's better to be over prepared than under prepared!' Below are 7 quick pointers to get you thinking forwards. Please feel free to email TLA and let us know what your plans are for the upcoming season as we would love to hear about your goals, challenges, programs and upcoming events no matter how small or big they maybe! Many of you that regularly train with TLA Fitness will know that Tom is currently racing a pretty tough race up the river Yukon. Welcome into 2018, we hope you have all enjoyed a fantastic Christmas & New Year and are now raring to go into those new resolutions - targets & training programmes!!! As ever we at TLA are committed to keep you on track and supporting everyone that trains with us through all our TLA classes and training activities. We have an action packed timetable for the new year and are really excited to see everyone back into training. 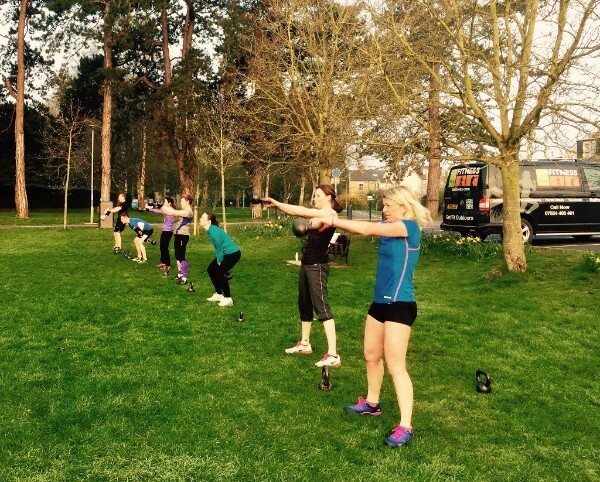 We are launching a NEW Beginners HIIT in Hinksey park on Tuesday evenings at 6:30pm. December, was as always a really good fun month with the added bonus of getting the TLA sledges out on December 10th. A fully committed team ran up to Boars Hill and made for a great winter TLA Bootcamp. The TLA Christmas Party was is full swing at The Bear in Cumnor with a full turn out. The TLA Fitness Team would also like to thank everyone very much indeed for our gifts which were Wiggle Vouchers and as always very greatly received. Have a very successful 2018 from all the TLA team! 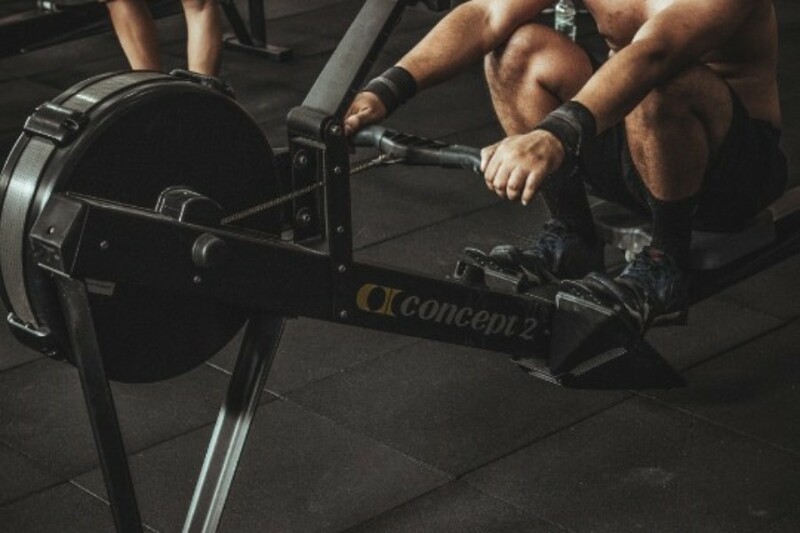 HIIT, or high-intensity interval training, is a training technique in which you give all-out, 100% personal effort through quick, intense bursts of exercise, followed by short, sometimes active, recovery periods. This type of training gets and keeps your heart rate up and burns more fat in less time. 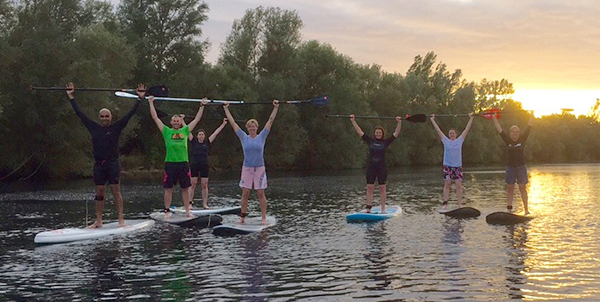 Quick 6 - Why do Hinksey HIIT? NEW Beginners HIIT runs every Tuesday evening at 18:30, meeting in Hinksey Park just off Abingdon Road (OX1 4RR) please arrive 18:20 for a prompt start! Intermediate-Advance HIIT runs every Tuesday evening 19:15, this is an established class and will not be suitable for beginners. Kettlebell HIIT runs every Thursday morning 06:30 (45mins), this is an established class but is suitable for beginners. Contact TLA for more details on these two classes. NEW Beginners HIIT class: Starting Tuesday 9th January 2018 - All new joiners that book their places before 1st January 2018 will receive the first 6 weeks half price, just £24 (6 week block). Book after 1st January 2018 and the cost will be £48 (6 week block). This special offer is for the first 6 weeks only in 2018 (from 9th January 2018 until 13th February) and is non-transferable. The offer expires on 13th February 2018. No classes on December 25th, 26th, 28th, 29th, 30th, 31st, January 1st & 2nd. TLA Classes: Wednesday 27th - TLA Kettlebells class at 6pm (The Studio) followed by Sunningwell Bootcamp (Sunningwell Hall) 7pm. We are super excited to bring this wild adventure trip into the TLA calendar. There has been lot's of interest in this trip so far and many are now getting booked on. The dates that have been decided are 11th - 14th May 2018. Please click here to read all about the trip. Also Tom will be delivering you a Quick 6 Awesome Core exercises. Into the Wild with TLA in the Pyrenees! 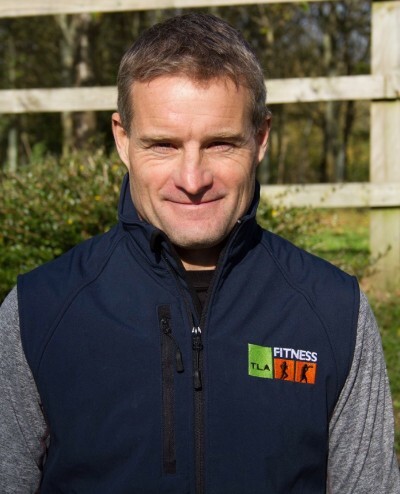 During the formation of TLA Fitness, it's been clear that one of the areas that is enjoyed most by our clients is that of training with like minded people outdoors! Getting outdoors, being active and really engaging with the surroundings is something we all love to do! So... 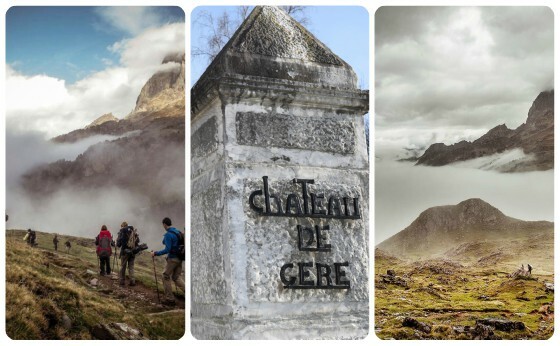 I have decided to gather interest on who would be up for a 4 day, 3 night (Fri-Mon) Adventure Hike into the wild to spend an amazing night camping under the stars in the beautiful Pyrenees in the south of France, based at the picturesque Chateau de Gere! There will of course be challenge, team camaraderie, adventure, great food, excellent instruction and time to switch off in the wild and discover new skills. Who is this suitable for? If you are interested in the above and below and it grabs your attention then it's most likely for you. Being a firm believer in setting a goal or having a target then this offers exactly that. 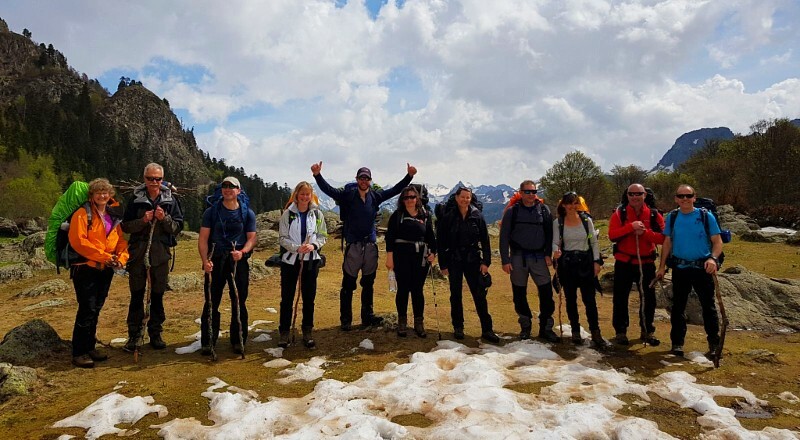 Living on what you carry on your back and being in and among one of the most scenic mountain ranges, being at the forefront of nature, exploring and giving yourself that all important head space, meeting others and striking new relationships is part of the fun and excitement that this trip will bring to you. Cost would be £499 per person (all inclusive) + flights (not included).Additional activities can be arranged during the hike also at a small additional cost Abseiling, Rock Climbing, Tyrolean Traverse, Survival Training. The dates in which I am looking to explore are: either 11th-14th May OR 25th-28th May (BH weekend), please do email your preferred dates. If you would genuinely be interested please email Tom on 'tom@tlafitness.com' and I will keep you posted. The perfect solution once you've finished your shopping, or dropped the kids off at school, or even fitting it into your lunch break! During November & December, TLA's very own Tony will be offering 30 minute 1:1 Boxing or Kettlebell sessions for only £20 per session. These can be arranged directly by messaging Tony on 07484 874561 or emailing: tony@tlafitness.com. You will need to give a bit of notice so we do ask for at least 2-3 hours notice and Tony will get back to you. This is only valid on Mondays & Tuesdays. Fact, we do not look after our bodies enough...! We run/bike/walk/play sports/attend classes/work very busy weeks but when do we really give ourselves that recovery/rest/break/relaxation time...? This is now on your TLA doorstep...you can now finally have a relaxing massage to end or start your week. 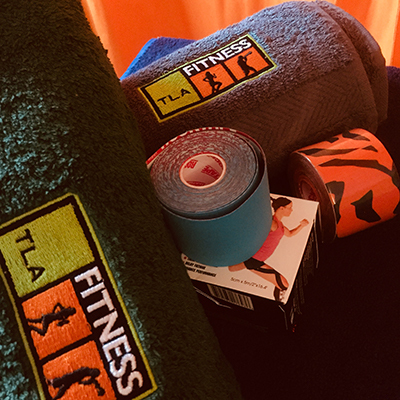 The TLA Fitness Studio has now a specially designed sports therapy and massage area which is fully equipped to treat/fix/relax/tape and relieve your muscles. Pollyanna is TLA's resident Sports Therapist and Masseur. Bringing a world of knowledge and experience along with her. Pollyanna has treated many TLA clients so far and has received first class feedback. Bookings are available by emailing directly to 'pollyanna@tlafitness.com' or text/call 07988 899427. TLA Membership offer: All treatments booked before 20th November 2017 will receive a 10% discount off your first massage or treatment. Jim is the most recent TLA instructor and brings a world of knowledge and experience to the TLA team. A through and through explorer. Jim is a former Royal Marine, having served across the globe in various roles. 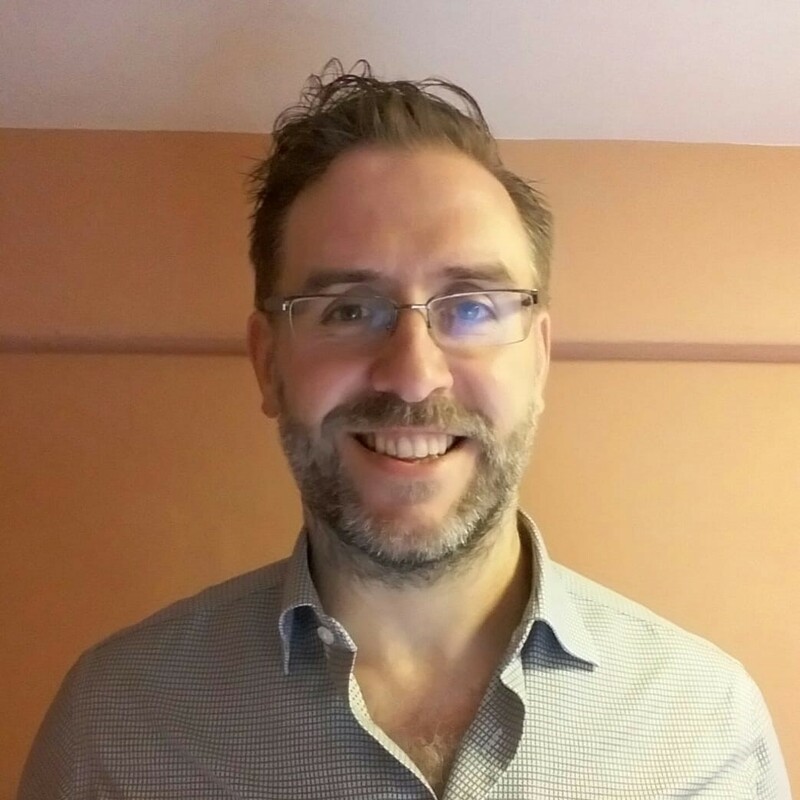 He has a BSc degree in Sports Science 1990-1994 and has completed Rowing Instructors courses, Royal Marines Military Ski and PTI courses to name just a few. Jim has a highly sought-after skill set which is often hard to come by! Please note the centre of Sunningwell is due for some major roadworks over the next few weeks - along Sunningwell Road, from Dark Lane right along to the The flowing Well will be access only for residents during that time. So access to The TLA Studio will not be possible from the Wootton Road / Long Furlong direction. Please plan a few minutes extra when heading to The TLA Studio. Autumn is upon us, but don't be SAD and don't let your training fall with the leaves! Below are TLA's 3 Autumn Kit Tips to put a smile on your face and give you a good excuse to go any buy yourself some training goodies! The daylight is becoming noticeably shorter so please be aware of this when you’re out and about training on your own! I have seen numerous runners and cyclists the past 3-4 weeks with nil visibility - NOT cool. High vis + lights are a very good/safe idea. Is all last years kit still fine? Or does it need one or two additions? If you are new to bootcamps or outdoor training and want to keep them going through the autumn and winter months, as it gets cooler in the mornings and evenings, you will need to put on an extra layer. Layers can always be secured in the instructor's vehicle during TLA classes (TLA Bootcamps). On colder mornings or evenings, those first few minutes when you get out of the door are when you will feel the chill. Lightweight hat and gloves will help you cope with this particularly if your hands end up on frozen ground! 3. Are you visible? Head torches for Sunningwell Bootcamp please! With the shortening days, just make sure you are safe. There are so many hi-vis tops and jackets out there so don't think you'll be looking silly by wearing one and also head torches to help you see and be seen. TLA's Sunningwell Bootcamp always requires you to bring along a head torch, please don't forget it! Absolutely correct, our super Pilates instructor Pollyanna will be starting a second Pure Pilates class on Monday 6th November at 10:05am. Class location will be Sunningwell Village Hall, Sunningwell Village. The class will cater for Beginners and Intermediate standards and is open to all ages. Signing up is very important, like all our TLA classes, as we do have a maximum number. Please email: heather@tlafitness.com to book and secure you place for this exciting new class. 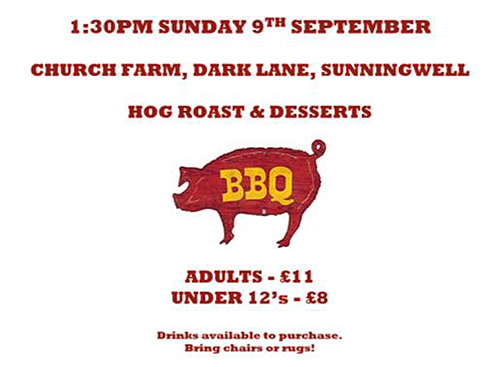 Families, friends and children all welcome! A reminder that TLA's Family Summer Bootcamps have started. Please email heather@tlafitness.com to book on. '8 overnight hours of mud and obstacles so tough, so extreme, you'll be trying to remind yourself why you signed up in the first place. Toughest Mudder is the overnight obstacle course designed to push you to your limits. 'That seems like a good idea, shall we do it? - yeah, why not!' 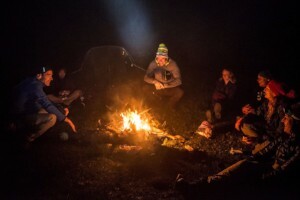 - these were the words we were wondering if we were going to regret when my friend and I signed up for Europe's Toughest Mudder - a new race in the Tough Mudder series, starting at midnight, ending at 8am the following morning - you have 8 hours go go round the 5 mile course as many times as you can. Sounded like great fun! The format is simple, you have a 5 mile course with around 20 obstacles that get opened up through the night, you can come back into the 'pit area' at the end of each lap to refuel, rest, change or whatever you need before heading out again. Rinse and repeat through the night. I have done obstacle races in the past, in the depths of Winter, so thought that this couldn't be too bad. We researched kit, training, nutrition and came into the race feeling pretty prepared and with a goal distance in mind. Training had gone well, weights, bodyweight, high intensity circuits, sprints, running and a ton of pull ups - lots and lots of pull ups! Carbo loading started 3 days out with a nutrition plan provided by Helen Money Nutrition and this stood us in good stead throughout the whole race - never once did we feel energy levels dropping or the dreaded 'wall'. Initially I had been quite worried about the whole starting at midnight and being up all night thing, as I don't do very well being tired, but the atmosphere was more than enough to keep us wide awake. The start was very exciting, around 700 competitors, head torches and strobes shining all waiting for the off, but not before the rousing pre-race talk which got everyone going. Midnight on the dot and we all head off on the first 'sprint lap' - minimal obstacles open apart from the ditches, and mud pits - this is designed to thin the field out and spread everyone out - this worked brilliantly, because throughout the whole race, we didn't queue once. The obstacles range from the mad (plunging into a container full of icy water - topped up regularly with ice cubes) - this is fun for the third time at 3 in the morning!! - to the ridiculous - trying to feed a metal pole through a hole to collect a band without touching the sides otherwise you receive a hefty jolt of electricity (this happened to me more than once!!!). A lot of climbing over things and up things, this is where the pull ups came into their own, not once did my upper body strength fail me. Only one obstacle got the better of me and that was one where you have to jump out into space (around 4 metres up) - grab a trapeze type of handle, swing out over the water to grab a rope and shimmy down - I have to admit I am very scared of heights and couldn't make the jump! - I had to scramble down into the water and swim across, then run the obligatory penalty lap carrying a sandbag - definitely something I need to work on! Our only low point was on our 3rd lap, around 3-5 in the morning, muscles started to seize up and cramp, we had to walk and then got cold - but after a bit of time in the pit area, clean dry clothes and a good stretch, we went out on our fourth and last lap and had a flyer - finishing on a real high. We managed 20 miles but had hoped for 25. The thing that let us down was a lack of long runs - something we will make sure doesn't happen next time - yes, that is right, next time - we are already signed up :-). It was an amazing event - running through the night, in the dark and then the dawn arriving was incredible - strangely the time actually flew by and I can't wait for next year. We hope you have all had a great Bank Holiday weekend. 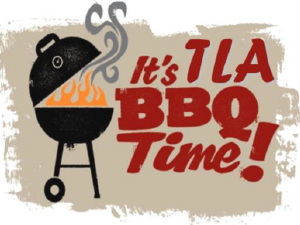 This is a short newsletter to say that all TLA's summer classes & courses are back in full swing so please check out our TLA Timetable for all the information. We are going to be taking a new direction with this next 8 week block moving to more strongman style training. This will include some super fun strength training such as tyre flips, sled drags and farmers walks and incorporating various lifting techniques amongst other things. TLA has the best facility for allowing the indoor/outdoor training style with it's excellent Studio space as well as it's own 7 acre woodland to play with for much of the training. A few spaces have become available for this next 8 week strength block, so if you are interested in improving your strength, coordination, power and speed, please get in touch with Heather to book on, email Heather. Classes will be around 45mins - 1 hour long, and start at 9:15am each week at the TLA Studio. The block is £85 for 8 weeks and is suitable for all abilities. The Strength courses run throughout the year and we do offer a cheaper membership option if you wanted to joined on a regular basis. If you want to try something a bit different, and mix up your training, get in touch. See you Saturday 13th May. I'm gathering interest on who would be up for a 4 day, 3 night (Fri-Mon) fitness holiday this coming September (date TBC - possibly looking at 3rd weekend in September) to the beautiful Pyrenees in the south of France, based at the picturesque Chateau de Gere! The weekend would consist of Kayak Training, Rock Climbing + Abseiling, Tyrolean Bridge (River Crossing) & Hill Running. The final day will consist of an adventure Race made up of all the above disciplines. If you would genuinely be interested please email Tom on 'tom@tlafitness.com' and we will keep you posted. OK, so not often does TLA Fitness deliver you a cracking offer! This March and for the whole of March we are offering a FREE month of Bootcamp classes for any existing TLA member. 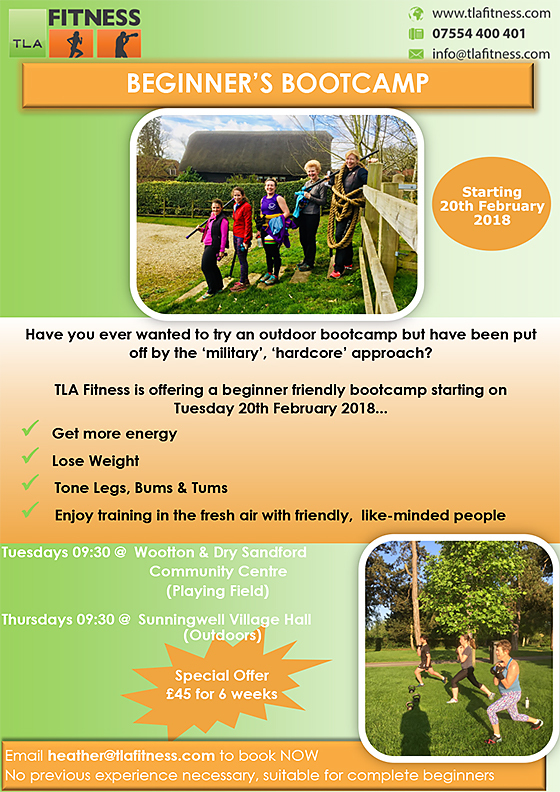 The conditions: Introduce a friend or family member or perhaps a neighbour or work colleague to TLA's Bootcamps and upon their 3 month anniversary of having joined the TLA Fitness membership you will receive a FREE month's worth of TLA Bootcamp classes! As you know, we love commitment as we know this is what people get results from and that's why we are asking your new joiner to stick around to see & feel the benefits of getting outside and feeling great, not to mention becoming part of our fantastic TLA community. TLA's Termly Classes Re-start from Monday 9th January. A new school term starts on Monday 9th January 2017 and all Pilates, Yoga, Strength courses & Core strength classes start back as per below. All classes are progressive and are run term on term. We do only except termly bookings and numbers are limited as per below. ALL TLA classes are suitable for beginners so please do email us your interest and we will get straight back to you with any questions you may have. Please click on each class to read the descriptions for the various TLA classes and courses in 2017. If you are interested in joining any of the above TLA classes please email heather@tlafitness.com as soon as possible as they are very likely to fill up. Christmas Dates + Extra classes! Welcome to December and the run up to Christmas and more excitingly the run up to 2017! TLA has a couple of exciting emails coming your way over the next few weeks announcing new classes, dates for the Christmas period and a few new plans for TLA in the new year. It has been a great 2016 and we are looking forwards to continuing on all of our current classes, as well as adding on more which will give you more choice and less of an excuse! With the continuing success of the Saturday lifting course, we are pleased to announce that we will be running a four week beginners lifting course in January 2017. The course will be suitable for those who have not really done any form of weight lifting before, but would be keen to learn and then look to join the regular Strength group. We will cover the Deadlift, Back Squat, Bench Press and Overhead Press, with a look into other lifts such as the Bent-Over Row, Romanian Deadlift and Bulgarian Split Squat. Lifting with Barbells is very satisfying and has a huge number of benefits, but it is important to learn the fundamentals of each move so you can do it safely and correctly. This will allow you to progress, gain maximum benefits and stay injury free. The course will start on Saturday January 7th at 10.30am and continue for 4 weeks. It will be held at the TLA Studio. The beginners lifting course will be held by Heather Grimes level 2 Strength & Conditioning Coach & Personal Trainer. The course will be limited to 8 people and will cost £45 for the whole four weeks. 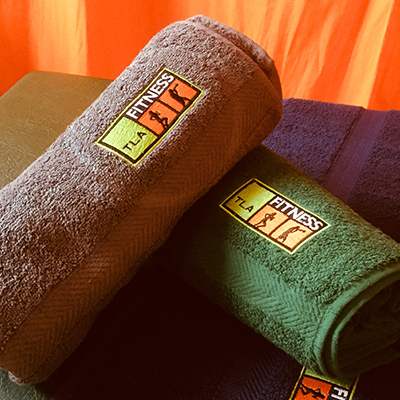 The first four people to sign up will receive a FREE Studio hand-towel (RRP-£15). Please contact Heather at heather@tlafitness.com or by clicking HERE to secure your place. 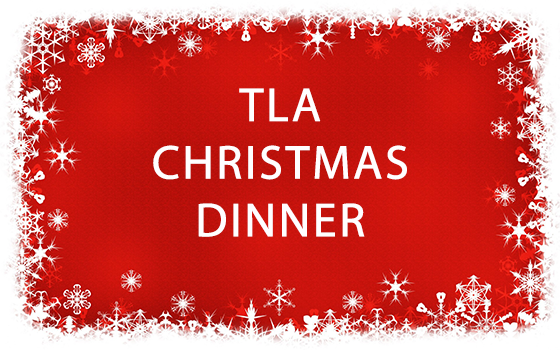 We are just days away from the TLA Christmas party - 7pm on Saturday 10th December at The Fox on Boars Hill. There are still a few places available so please do get in touch with The Fox Pub if you haven't already put you names down by contacting Zuzi on mail@thefoxinn.pub or call 01865 735131. For those of you who are booked on, please do let the pub know your menu selections.